Whitelock, J. S. (Jim) (James Stredder), 1925-, architect. Architecture, Domestic - New South Wales - Caringbah - Designs and plans. 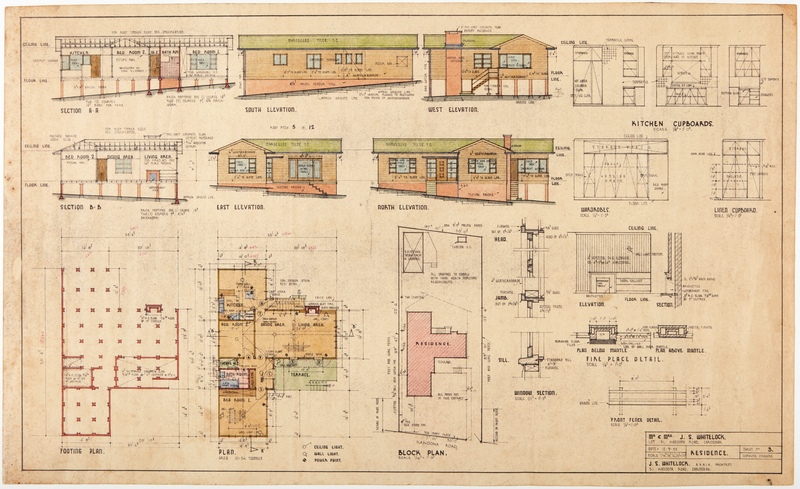 Set of plans for a post-war suburban house comprising original 1952 plans, 1961 additions and 1982 additions: 2 copies of sheet no.3 working drawings for Residence, dated 12.9.1952 (1 ink on linen, 1 ink & colour on card); sheets nos 1 and 2 working drawings for Residence additions, dated 20 May 1961 (tracing paper); sheets nos 1 and 2 working drawings for Residence additions, dated August 1982 (tracing paper). 6 architectural drawings : ink; ink & colour pencil ; 45 x 85 cm.